Susan commenced with Flex Out Physiotherapy after moving with her family from Sydney. Since graduating from Sydney University in 2003, Susan has worked with the Australian Defence Force and in various private practice’s in Sydney. 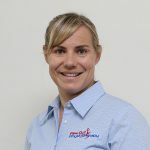 Susan has a keen interest in musculoskeletal injuries having completed her Masters of Manual Therapy in 2006. Susan is accredited in dry needling and skilled in casting and splinting. What is an APA Titled Musculoskeletal Physiotherapist? An APA Titled Physiotherapist is highly qualified physiotherapist with expert knowledge and skills in the area of musculoskeletal physiotherapy. They undergo a rigorous selection process to ensure that they achieve and maintain exceptional standards of clinical experience and knowledge. The APA Title serves as a professional mark of distinction.